"The Ultimate Moment To Say Thank You And Farewell"
“The Gods And Kings Tour was a groundbreaking moment in our career. The stage, sound, video and you, our fans, were magnificent! Coming off such an amazing tour it was clear that the next time we must go even bigger and beyond anything we have ever done; something that will fulfill every Manowarrior’s dreams. Then that will be the ultimate moment to say thank you and farewell! The Final Battle will begin in Germany and take us all over the world to say goodbye to all of you. If you know metal, you know MANOWAR. 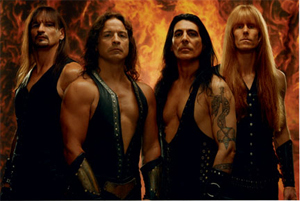 If you know MANOWAR, you know metal! Stay tuned for more details and the tour schedule, to be announced soon.